Yogalaya Bharathanatyam School at Anna Nagar conducts the Salangai Pooja of its students Meghna, Nitya, Deepika, Shakthi, Vinamrata and Lakshmi – disciples of Guru Smt. 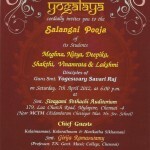 Yogeswary Savari Raj on April 7th, 2012, Saturday at 6.00 pm. The venue is: Smt. Sivagami Petachi Auditorium, 179, Luz Church Road, Mylapore, Chennai – 4 (Near MCTM Chidambaram Chettiyar Mat. Hr. Sec. School). 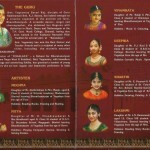 Here is the invitation to Meghna and friends salangai pooja.